Help consumers identify your product as Powder Coated Tough. Put our resources to work to move your product by joining The Powder Coated TOUGH Mark Program today! The Powder Coated Tough trademark, the "Mark," was developed by The Powder Coating Institute in response to research of consumers and the industry. The research indicates that a product's finish is very important to consumers when making a purchase decision. Consumers want products that are durable, attractive, scratch-resistant, and long lasting. And when they learn that a powder coated finish provides these attributes and more, this is the finish they want. Due to a significant shift in the world's interest in environmental friendliness and carbon footprint of the products they use, the Mark logo has recently undergone a redesign (formally known as The Mark) to reflect this trend as it is one of the most important benefits of powder coating. The logo continues to reflect the durability of powder coating, but also emphasizes the environmental sustainability it represents. When consumers see the Powder Coated Tough Mark on a product, they'll know that the product is a good value — it's durable, attractive, friendly to the environment and will last them a long time. By using the Powder Coated Mark on your products and in your advertising and promotional materials, you will clearly identify your company as a leader and a producer of powder coated products. Your products will be easily recognizable by consumers as having a powder coated finish. PCI Members can use the TOUGH Mark at no charge, but must complete an application agreeing to the usage requirements. Non-members that are end-users and wish to use the TOUGH Mark may complete an application. A yearly fee of $1,250 to use the TOUGH Mark will apply to non-members. To participate in The Powder Coated TOUGH Mark Program, please contact Leslie Muck at leslie@goyermgt.com. 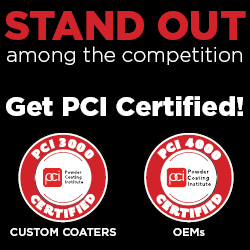 PCI Members can click here to order Powder Coated TOUGH Mark Products.